2010 Sun Tracker PARTY BARGE 24 Classic Series The SUN TRACKER PARTY BARGE 24 Classic Series is a family fishing pontoon you can literally use 24/7. Cruise and fish at sunrise. After lunch, explore, swim, tube and catch some rays. And as the sun goes down, set up camp and gather 'round the campfire. Let nature lull you to sleep. When the new day dawns, you'll be ready!The PARTY BARGE 24 loves long days on the water. The onboard changing room, softly padded sundeck, movable dining and game table, plush L-lounge and couches are geared for all-day comfort and fun. 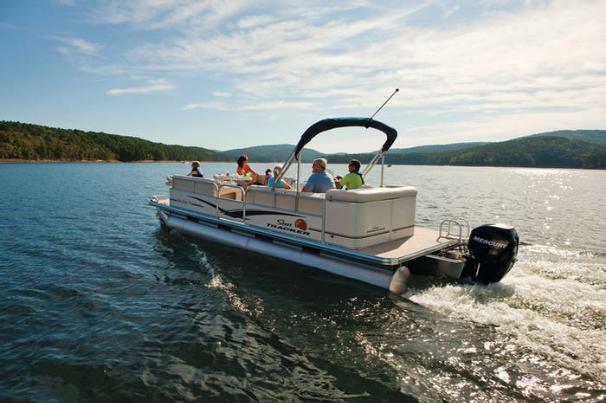 From the fishing deck and chairs up front, all the way back to the full-width swim platform, this boat lets you use every inch! Features: 24" multichambered aluminum tubes. Extended all-welded aluminum motor pod for more usable deck space, Color-keyed 7' polyester Bimini top, Captain's plush and supportive bucket seat, Fiberglass-reinforced console w/tinted windscreen, easy-to-read gauges, storage and trash receptacle. Sirius-capable AM/FM/CD stereo w/MP3 jack and 2 speakers .Removable dining and game table w/bow and aft bases. 2 bow folding fishing chairs, 2 long bow couches w/closed underseat storage, and small-item armrest storage. Aft L-lounge w/closed underseat storage and small-item armrest storage. Aft padded sundeck w/pop-up changing room below. Full-width aft swim platform w/fold-down boarding ladder. In addition extra cleats have been added for easier and more secure mooring of the boat. The included outboard motor is a Mercury 60HP 4 stroke big foot. 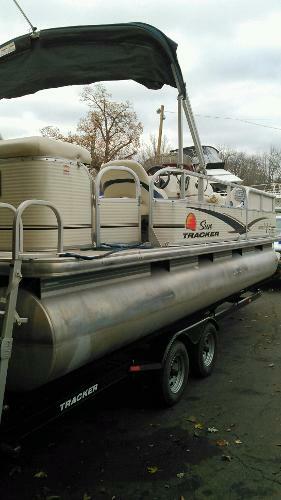 This is a one owner freshwater boat. A tandem axle trailer is included.